Well, they weren’t supposed to be green at least according to the photos on the original recipe. My husband and daughter didn’t complain though! 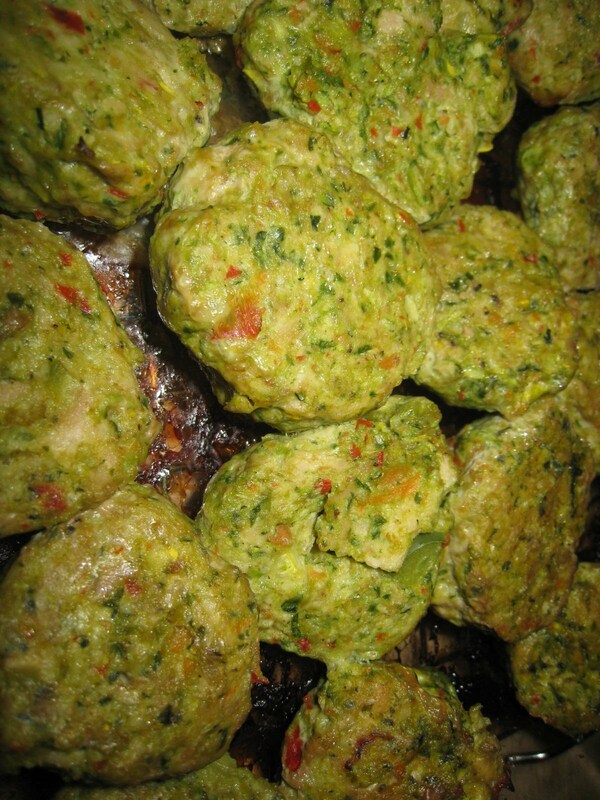 They’re good for you and a great way to sneak veggies into meatballs if you have a picky eater. This recipe can easily be cut in half. Preheat oven to 350 degrees. In a food processor, chop all veggies and put into a large bowl. Add the ground chicken, breadcrumbs, eggs, salt, pepper and garlic and mix until all ingredients are combined. Form meatballs into golf shape sizes and place them on a greased baking sheet. Bake for 30 minutes, flip and then bake for another 20 minutes. If desired, simmer in any tomato sauce for about 20 minutes and enjoy.